An artist's rendering of the New Horizon spacecraft. A NASA probe speeding toward the distant dwarf planet Pluto hit a major checkpoint today (March 19) when it crossed the orbit of Uranus. NASA's New Horizons spacecraft encountered Uranus' orbit today at 6 p.m. EDT (2200 GMT) while flying 1.8 billion miles (2.9 billion kilometers) from Earth. "New Horizons is all about delayed gratification, and out 9 1/2-year cruise to the Pluto system illustrates that," said principal investigator Alan Stern, of the Southwest Research Institute in Boulder, Colo. "Crossing the orbit of Uranus is another milepost along our long journey to the very frontier of exploration." NASA billed New Horizons as its fastest spacecraft ever launched when it sprinted away from Earth at about 36,000 mph (nearly 58,000 kph) in January 2006. It has covered some serious space since then— traversing 20 times the distance between Earth and the sun, including a 2007 flight through the Jupiter system for a gravity-assisted speed boost and to snap new photos of the giant planet and its moons. "This mission is a marathon," said project manager Glen Fountain of the Applied Physics Laboratory of Maryland's Johns Hopkins University. "The New Horizons team has been focused on keeping the spacecraft on course and preparing for Pluto. So far, so good, and we are working to keep it that way." An overhead view of the New Horizons spacecraft's path across Uranus' orbit. Since the New Horizons probe is currently in an electronic sleep mode, and since Uranus will be 2.4 billion miles (nearly 3.9 billion km) from the spacecraft when the probe crosses the planet's orbit, the science team is not planning to take any pictures of the gas giant during its pass. 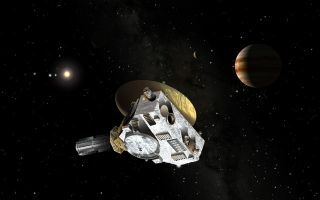 The mission team on the ground is busy making final preparations for the probe's rendezvous with Pluto, and in April, scientists will begin searching for potential flyby targets in the Kuiper Belt. Preparations are also underway for the spacecraft's annual systems checkout in the spring. In the meantime, New Horizons continues its blistering pace toward Pluto. The next planetary milestone for the intrepid explorer will be to cross the orbit of Neptune, which will occur on Aug. 25, 2014 – exactly 25 years after the Voyager 2 spacecraft made its historic exploration of that giant planet.